You like drinking, sure, and maybe you even have a few favorite cocktails that you like to order when out and about. But do you know how to make ‘em for yourself at home? If not, stay tuned because over the next few weeks I’ll be spotlighting a few essential cocktails with which to start your home bartending career. Nothing crazy complicated, but rather, classics that everyone should have in their back pocket. I wager that after you’ve got these down, your friends will be asking you to bartend at their parties…. Um, OK, so maybe we won’t tell them about your new skills. And for the non-DIYers, I’ll include *THE* places to get the best example of the spotlighted cocktails. And Eagle Rock cocktail geek Chuck Taggart of GumboPages.com knows all about the Sazerac. Being a native New Orleanian, his love affair with New Orleans’ official cocktail began in 2000 when he and his partner Wesley went on the hunt for the best Sazerac in the Big Easy. Whether they found it after the 15 or so examples they tried is up for debate. But that dizzy day set off a love affair with the cocktail. For his research, he immersed himself in cocktail historical literature, interviewed preeminent cocktail experts like “Dr. Cocktail” Ted Haigh, Robert “Drink Boy” Hess, and Gary Regan and went on to taste A LOT more Sazeracs. In the end, Chuck has fine-tuned a recipe that I consider one of the best; I admire the amount of research that went into it, and it’s got an exceptional balance of flavors that respects the cocktail’s tradition. But, before we get to appreciating the flavors of the Sazerac, let’s get to know a bit about its history. 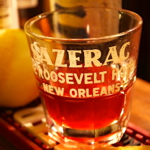 The predecessor of the Sazerac was a simple brandy toddy, popularized in New Orleans in 1838 by Creole druggist Antoine Amadie Peychaud, who served up the cocktail with his family’s bitters. By 1850, the Sazerac cocktail as we now know it was standardized at Merchants Exchange Coffee House (really a saloon) on Exchange Alley, using a few drops of absinthe “to give it a few more layers of flavor.” The coffeehouse’s owner, Sewell Taylor, was also a liquor importer whose most popular product was the Sazerac-du-Forge et Fils cognac which was used in the cocktail. Eventually the name of the coffeehouse changed to Sazerac Coffee House with its most requested drink taking on its name as well. But thanks to the changing tastes of Americans, who preferred American rye to French brandy, the cocktail was most often made with rye whiskey. But that’s getting a little ahead of ourselves. First, here’s Chuck’s recipe. 2) Drop in simple syrup and bitters. If using a sugar cube, also drop in no more than a half an ounce of water to help dissolve it. 4) Get the chilled glass and put in 2 or 3 dashes of absinthe. Rotate the glass to evenly coat it with the absinthe. You can choose to toss out the excess or keep it, depending on how much of that anise flavor you want in your cocktail. 5) Strain the whiskey from the mixing glass to the chilled glass using a julep strainer. 6) Squeeze the lemon peel over the glass and wipe the rim with it, but for god’s sake DO NOT drop it in. As Stanley Clisby Arthur, New Orleans author, says in his 1936 book Old New Orleans: A History of the Vieux Carre, Its Ancient and Historical Buildings, “Do not commit the sacrilege of dropping it into the drink.” Basically you don’t want to throw the balance off and let it get too lemony. Even though Chuck is particular about the traditions of the Sazerac he does prefer to use simple syrup instead of actual sugar cubes like they must have used in the old days for the fact he doesn’t like the texture. However, he opts for the demerara or turbinado sugar because of the little bit of molasses that would have been present in the sugar during the 1800s of the cocktail’s heyday. Also, if you’re going to add cognac, Chuck recommends trying half rye and half cognac. If you’re going for an all-cognac recipe, use an orange peel instead of lemon. With regards to using absinthe versus Herbsaint, the original cocktail was made with absinthe til the green spirit was banned in 1912. And Herbsaint, created afterward as its legal substitute, “is perfectly good.” But if you want to be authentic, stick to the Green Fairy. Even though Chuck usually makes Sazeracs at home, he does have his favorites out in L.A. like “any place Marcos Tello is behind the bar.” He also noted The Parish, Seven Grand and Justin Pike at Tasting Kitchen for their amazing Sazs.